LANSING (MAY 25, 2018) — Sharing office space with a law firm that also hosts receptions for clients apparently has perks. A little over a year after the Michigan Senate moved its offices into a new building, there are days when senators are just an elevator ride away from private parties offering free food and drink, according to invitations they’ve received. That’s because the Senate is now sharing an office building with the law firm Dykema, which provides lobbying services for a wide array of clients. The firm hosted receptions before the Senate became its downstairs neighbor, and it continues to host events. Similar to a person owning a condominium in a larger complex, the Senate occupies the first seven floors of the building, which it uses for committee meetings and lawmakers’ offices. Dykema continues to occupy the eighth and ninth floors. In this setup, there are times when senators are invited to take the short trip from their state-funded offices to the Dykema offices upstairs for private receptions. 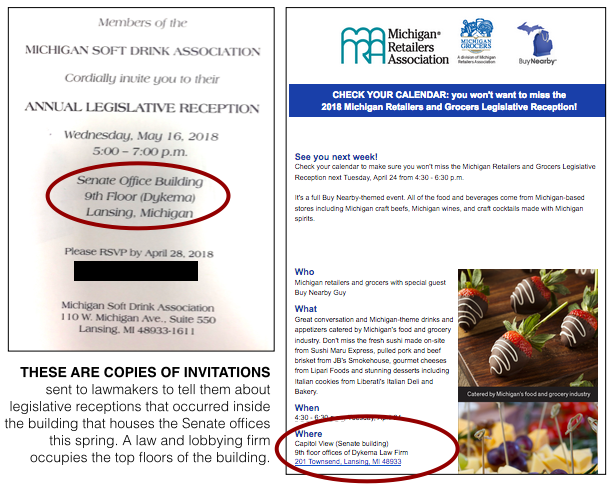 For instance, the Michigan Soft Drink Association invited lawmakers to a legislative reception on the ninth floor of the building just last week, May 16. A few weeks earlier, on April 24, the Michigan Retailers Association and the Michigan Grocers Association invited lawmakers to another reception. Theirs featured gourmet cheeses and “sushi made on-site," according to the invitation. The event also offered craft beers, wines and craft cocktails. As the April 24 reception was taking place on the ninth floor, a Senate security guard on the first floor could be heard in the lobby telling guests who were not lawmakers and were looking for the upstairs event how to get there. One person walked in the front of the building and headed straight to security desk. “The legislative reception is on the ninth floor?” the person asked. It’s unclear how many lawmakers attend the receptions above their offices. And it’s also unclear how often Dykema hosts such events. Michigan lobbyists' required disclosures don’t include information on where receptions for groups of lawmakers take place. Asked if the Senate has any policies concerning interest groups offering free food and alcohol to lawmakers on the top floors of the buidling, Amber McCann, press secretary for Senate Republicans, said the top two floors of the building are owned by a private entity. It’s an entity over which the Senate has no regulation, she said. Timothy Trunzo, marketing manager for Dykema, emphasized that Dykema has long hosted receptions in its Lansing office and didn’t simply start hosting the events after the Senate moved into the building. Both the Michigan Soft Drink Association and the Michigan Retailers Association have been firm clients for decades, Trunzo said. “We always have and will continue to comply with applicable laws and regulations in hosting events in any of our offices,” he said. The Michigan Senate officially moved into the building in January 2017. Owned by the Boji Group, the building, which stands across the street from the Capitol, is commonly known as the Capitol View. The Senate officially calls it the Connie B. Binsfeld Office Building. Citing concerns for safety and for the cost of improving its old office building, the Michigan Senate began pursuing office space in a newer building in 2014. Multiple media outlets have reported that the new office space came with an initial purchase price of $51 million. Some state House members, like Rep. Scott Dianda, a Democrat from Calumet, have spoken out against the Senate’s purchase of the office space. Some lawmakers have specifically criticized the fact the Senate is now sharing office the building with lobbyists. The political newsletter MIRS News reported in 2015 that it could find no other state where lawmakers shared an office building with a lobbying firm. 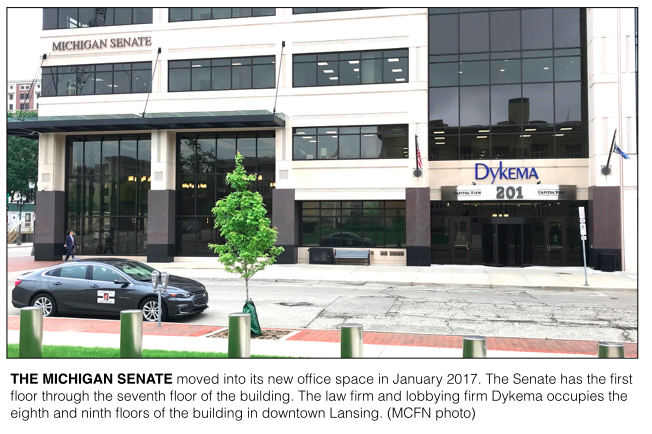 At the time, an official with Dykema's Lansing office, told MIRS that before the move, Dykema was just across the street from the Senate offices. According to the Michigan Campaign Finance Network’s tracking, Dykema was the 27th largest spender on lobbying in Michigan in 2017. Dykema reported spending a total of $191,631 on lobbying during the year. When it comes to legislative fundraisers and receptions, proximity seems to play a role. Of the 601 fundraisers state officeholders reported having in 2017, about 47 percent of them occurred within walking distance of the Capitol on days the Legislature was in session.